While it sits on the higher end of the price spectrum, the ASUS Republic of Gamers Swift PG348Q UltraWide monitor has a screen that is simply incredible winning our award for the best UltraWide gaming monitor 2018. Its massive 34" size, 100Hz refresh rate and low latency coupled with an IPS display makes this monitor truly epic in and out of the game. This gaming screen is 34 inches diagonal, with a 21:9 ultra-wide aspect ratio. These specs alone will benefit any game, no matter the style. The wider ratio means better views and vantage points for racing and first person shooter games, as well as more accommodation in MMORPGs and similar games. The benefits of a wider screen with crisp images outweigh the benefits of a taller screen with common aspect ratios. The PG348Q won our award for the best UltraWide gaming monitor in our top 5 round up review of the market for 2019. The display utilizes Nvidia Gsync, which keeps the screen from sputtering because it matches the GPU’s frame rate with the refresh rate of the monitor itself, so the two are always on the same level. 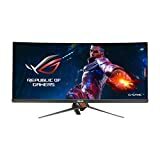 This Asus model typically runs at a refresh rate of about 100 HZ, which is more than enough, although some other screens offer up to 144 Hz. Its response time also sits at around 5 ms, so it is quick. Gsync only works with DisplayPort, though, and will not be as crisp on a simple HDMI input. The IPS panel featured in this ASUS screen is truly remarkable. It is a true 10-bit screen, and it can render over a billion different colors, making sharp and clear images. The size and scope of this IPS panel make it capable of displaying 100% of the colors in the sRGB spectrum. The panel is also 1440p, and it is an amazing piece of technology for gamers everywhere. ​The design is incredible, but in a way, that makes it truly one of a kind and futuristic-ally stylish. Its finished in a gunmetal gray with rusty orange indentations and accents, which is not a color scheme typically associated with gaming set ups. However, Asus always tries to break the mold with their designs, and this is no different. Even the stand, with its long three prongs that jut out a bit farther from the screen and curve inward, creates an overall futuristic, ostentatious effect that is still weirdly attractive. The 34” screen also has a slight curve, but not enough that it ruins the color quality around the edges, as some curved screens can do. The screen itself is LCD, but the bottom edge of the screen features an LED projection of the ROG logo for dedicated gamers. The screen, because it is on the larger size for a gaming monitor, has a heftier weight than most of its competitors. It weighs 11.1 kilograms, or about 34 pounds, far outweighing the competition and making it less than portable – though you probably wouldn’t need to transport a screen from your home all that often anyhow. However, its lengthy legs on its stand also make it incredibly bulky to carry or even set up. From front to back, the legs measure 297 millimeters, which is nearly a foot in length. It is also much wider and taller than other screens, so you would need plenty of set up room. Despite this, though, its wide screen and attractive design make it a great gaming investment. ​We’ve already mentioned the lengthy curved stand legs, the curvature of the screen, and the gunmetal gray finish with deep orange accents in this ASUS ROG Swift PG348Q review, but these are not the only aspects of the design that make this screen both quirky and attractive for gamers. Despite its height and width—both of which far outshine its immediate competition—its cool stand also has height adjustment of 115mm and even has about 25 degrees of tilt, making it far more versatile than you would expect from such a large screen and stand. It features both a DisplayPort outlet and an HDMI outlet, though they may be somewhat difficult to locate at first. If you are intending the screen to be rather stationary and used for only one or two devices, the difficulty of locating the ports will not be much of an issue. The ports are on the underside of the screen and covered by a plastic shroud, which is removable. ​In simpler terms, here are a few good things and bad things about this particular model. This great machine comes with a hefty price tag, but if you are willing to make the investment, it does have features that far outweigh its competitors, like Samsung. However, if the wider screen and flexibility of the panel are of no interest to you, something in a lower price range may be just what you need. However, for some crystal-clear gaming and an adaptable screen, this model is worth its price. Therefore, this gaming laptop from Razer could arguably be considered to be one of the best desktop replacement that you would be able to carry around. From the perspective of comfort and power, we have found ourselves to feel right at home from the very beginning. This is because this laptop would be vibrant and roomy for any kind of production work that you would require. So, if a gorgeous quality, portability, incredible keyboard, and build quality would be some of the main determining factors for your next buy, then the Razer Blade Pro would be absolute value for your money. There is no doubt that gaming laptops from Gigabyte have always managed to offered superb performance which could be packed in a portable and thin package. That is why it was good to see that Aero 14 was also no different. As a result, it has managed to stand above its counterparts with better numbers in benchmarks; that too at an affordable price. Therefore, if you are on the lookout for a good and stable 17-inch gaming notebook on the market, then this one would undoubtedly be a good buy. That being said, this would seem like a pretty good replacement for a compact desktop. However, it would not be suitable for people who would find themselves to be always on the run. As far as aesthetics are concerned, you would find this laptop to be so red that it might even blind you momentarily. However, when you get back to normal, you would also agree that this would be one of its most eye-catching features. The palm rest and keyboard deck has been made black with red color accents on the keyboard. All this would be complete with a red backlight. As for those people who would like to go with a more subtle look, an all-black variant has also been made. Weighing only six pounds and just being an inch thick, anyone and everyone would be able to tell that you are carrying a Dell laptop in your backpack. Other than all this, we would also like to point out that the hinge on this laptop would undoubtedly be the best hinge that has been used by us in a while. Thus, despite everything that Dell has to offer in this notebook, there is no denying the fact that it is in need of a major upgrade. However, it does do an excellent job of the everyday needs of computing while also keeping up with the demands of computer games. This laptop has overcome its shortcomings with its affordable price point and powerful performance. All in all, this would definitely be a trade that you would be willing to make. However, thanks to Gigabyte, they have managed to break this trend with this SabrePro 15. As its name would suggest, this would be a higher-end version of its budget-friendly version Sabre gaming notebook. In this 15-inch version, you would be able to get better graphics, faster processor, and an RGB keyboard. In addition, thanks to it being reasonably priced, you would also not have to worry about breaking the bank. The thought of having to pay almost $2,000 for a gaming laptop would make any sane person pause. That is why the Gigabyte SabrePro would come as a refreshing change thanks to its affordable price. Even though it does not have the build quality that you would be able to find in other laptops, this definitely will be able to give you a good performance. All that being said, this would be one of the most affordable and powerful gaming notebooks that you would be able to buy today. Hey You Guys! (Sorry I can't resist a good Goonies reference), as you may have guessed I'm a child of the 80's. I've grown up playing video games such as Doom, Quake, Quake 2 and Half-life which obviously lead me to a serious Counter Strike addiction. Thus, that brings us to the end of the review of the top 10 gaming laptops in 2107. Hopefully this would have armed you with enough information to make a smart and rational purchase decision at the end of the day. In addition, it should also have made you aware of the particular features and specifications that you should be keeping an eye out for. Ever since Nvidia 10-series Pascal GPUs seem to have entered the scene, you would not have been able to find many powerful and affordable gaming notebooks. That being said, that would actually have been quite a bummer because you must have had a very hard time making your choice with the limited range that you had at disposal.